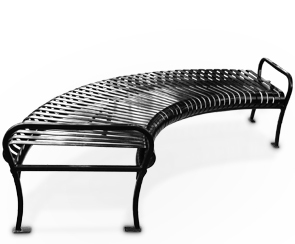 These backless benches were designed to go around trees, planters, fire pits or anything else you want as a focal centerpiece. Variety of sizes are available to fit your needs to maximize seating capacity. Legs have predrilled holes for easy surface mounting. Connect the backless benches in an opposite, snakelike pattern for a custom look that fits your space limitations and works around existing landscape. Half-circle benches look excellent up against walls, three quarters benches can fit around a corner or full circle benches around anything you want. The capabilities are endless. 3/16" x 1-1/2" HR Flat Bar. 1" x 18" HSS Square Tube. 1-2/3" Dia. x 1/8" Crossbars.